Home City Wise Business Is Cincinnati Too Focused on Quick-Fix Schemes? Is Cincinnati Too Focused on Quick-Fix Schemes? By the time you’re reading this, there’s a chance we’ll know whether our city’s professional soccer team, FC Cincinnati, has secured that elusive promotion to Major League Soccer—and more important, where they’ve decided to wedge in the required soccer-specific stadium. What we already know for sure is how the powers that be—team owners, investors, elected officials, interest groups—have moved heaven and earth to turn a hypothetical stadium into a reality. It started with the seemingly shovel-ready Newport site, which was backburnered for a hurried Oakley proposal, which was really just a Trojan Horse for a West End plan that proved to have less public support than Marvin Lewis. There were fights over infrastructure money, parking garages, and tax abatements. It’s been one calamity after another. To be fair, it makes sense why team owners and stakeholders are so keen to make something happen; an MLS franchise makes for a better investment. But the way this is being sold to the rest of us is as some benevolent public service—a way to revive the West End, draw enterprising millennials to town, catapult a city already on the upswing into the next tier of next hot places. Mayor John Cranley told The Cincinnati Enquirer that an MLS team (and stadium) provides the city an opportunity “to obtain national and international renown.” Which is a bit misleading, if not blatantly disingenuous. Having a top-tier soccer team would be a good thing, and signal a city that is indeed moving in the right direction. But it should be the result, not the catalyst. No one is moving to Cincinnati for Major League Soccer, regardless of what any mayor or owner may tell you, but MLS has made clear that it will willingly put down roots in favorable markets. It’s why the league awarded an expansion bid to a brand new Nashville franchise, and been complicit in attempts to hijack an existing Columbus organization to Austin. If Cincinnati continues on its current path of job growth and development, revitalizing neighborhoods and attracting transplants, MLS will go out of its way to come here. Instead, the city is betting big on a shiny new stadium to fill in those gaps, with little regard for the neighborhoods and residents likely to be impacted the most. A better example is the city’s failed attempt to woo the coveted Amazon HQ2. There was nothing to lose by making a run at the online-book-retailer-turned-omniscient-overlord—just about every American city mentioned in the lyrics to “Jump On It” rolled out the red carpet. And though we didn’t make the list of 20 finalists named in late January, that more or less hastened the inevitable; Cincinnati was never going to win the bid, and neither will Indianapolis, Columbus, or Pittsburgh, even though they did make the top 20. But the city’s collective disappointment over missing the cut was actually an encouraging sign. Ten, 15 years ago, the general consensus likely would have been Of course we didn’t make it. Why would Amazon want to come here? The steady erosion of that inferiority complex, and full-throated belief that we belong in the same weight class as the other finalists, is as good a sign as any of the city’s positive momentum. The problem, however, was in the details of our city’s proposal. From the moment Amazon announced its dramatic new season of The Bachelor: HQ2, one of Cincinnati’s most glaring barriers to entry was its transportation system—an underperforming and rudderless streetcar as well as a disjointed and decentralized regional bus system. But rather than jump-starting a concerted, collective effort by local officials to evaluate and address the issue, that energy went toward an all-out Amazon pitch that hitched a floundering streetcar to the notion that the new headquarters’ mere existence would solve all our transportation woes. The pitch (in addition to $3.1 billion in economic incentives, according to the Cincinnati Business Courier) proposed everything from company shuttles and rapid-transit bus lines to light rail, a streetcar extension to Northern Kentucky, kayak routes across the Ohio River, and—no joke—water jetpacks, with scant details on how to fund or execute any of these options. The Business Courier also quoted the proposal as stating Amazon’s presence would offer “a unique opportunity to build upon the recommendations of the regional transportation plan and develop an enhanced vision for future transit development.” Instead of dressing for the jobs we want, we tried to order a whole new wardrobe via two-day free shipping. Cincinnati is undeniably a city on the rise, and well positioned to continue in that direction. But that didn’t happen overnight. Confidently pursuing major league franchises and blue-chip companies are good and commendable things, but not if that process undermines all the deliberate efforts and steadfast citizens that brought us this far, or stifles the same regularly undermined neighborhoods and underrepresented people. 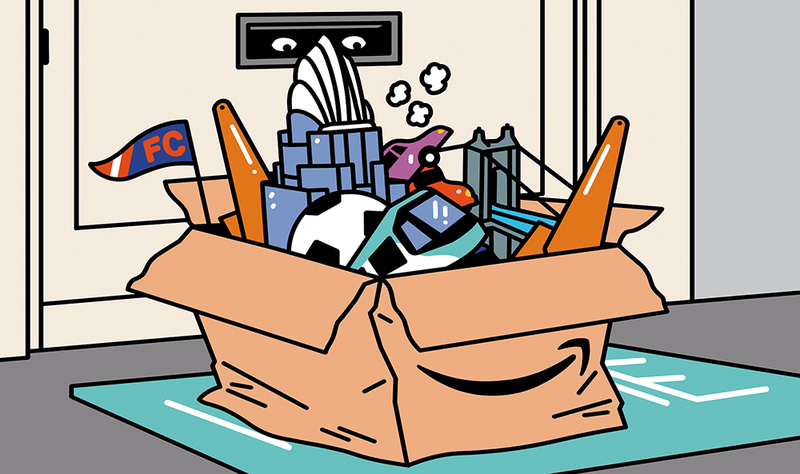 The problem with the soccer stadium and Amazon bids is the way local leaders and power brokers leveraged two decades of hard-won progress toward quick-fix schemes to complex issues. There’s nothing wrong with wanting to sit at the cool kids’ table, as long as we remember we have to take the bus to get there.